Itâ€™s great for weekends or short trips, and offers everything from simple and easy adjustments to extra comfort and durability. The intra-track suspension system slides on aluminum stays locked by a web strap, so itâ€™s easy to adjust. Bombproof. I’ve had it overloaded more than once. Simple. There’s nothing extra on the bag other than the internal divider. Large side pockets that hold a large Ikea hobo stove on one side and my 6 cup Imusa hobo kettle on the other side. Great winter bag for when you have to carry more gear. Lots of adjustabilityfor fit. I got this backpack used in a thrift store for about $35.00. It is well worth it at that! I also don’t think I would have any problems paying $100 which I believe is the full retail price. My used bag was in good condition. Simple. Maybe it could use a hip pocket or something. The top zipper pouch over the main compartment isn’t removable. No load compressor straps - you can’t pack it tall and skinny unless you use the built in shelf, but even then there’s no way to stabilize the load. A little heavy I think. 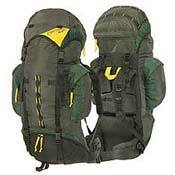 But for a pack that can carry a pretty heavy load I know it’s not weak. I have owned my Shasta since I was 20 years old. I'm now 31 and I still use it. Most of my trips are only a few days long. I have never done anything over 6 days with it, but I have done many fly fishing/backpacking trips and this pack has done a tremendous job and lugging rather heavy gear miles into the backcountry. the only thing that has broken in 11 years is the one strap buckle. Easily replaced. I rate it a 3.5 in comfort and a 5 in durability. Its simple and to the point, but a roughneck as far as packs are concerned. This bag has been all over the world with me. i love 20+ states. 15+ countries. i have had it for 6 years. i have never had any sort of issue with it. it held up very well!!! i love it. you should totally buy it. Only four pounds! Reallitively cheap. And after 40 days it hasn't busted a seem or broken a zipper. My highest load was only 40-45 pounds. It carried well. I wish that the top lid would be removable. Simple and lightweight describes this basic pack and it has served me well for the past four years. A top-loader with two side pockets fits about 5,000 cu.in. it has hauled as much as 60 pounds on my back at one time (carrying 3-days worth of water in SW Texas). Needless to say, 40-50 pounds is the max for comfort as the hip belt is not very firm. Anything above 50 pounds begins to put strain on the shoulders. It's a cost-effective pack, but one that will remind you that you've been hiking all day with your house strapped to your back. The harness adjusts quite well to fit your torso but don't get me wrong here... a Gregory or Dana Design wearer would turn up their nose at the Camptrails. Features are few, but it will hold a water bottle in each side, has one top and two side compartments for quick-access-items, and a convenient bungee cross on the very top to lash things down (wet clothes, dinner bowl, etc). If you are pinched in the pocketbook but need a good 3-6 day pack that will last you long enough until you make a salary where you can afford a Gregory or Dana Designs, then this is a quality alternative that will get the job done. It's gotten me to the highest point in 9 states as well as through 12 national parks since I purchased it four years ago. My Shasta now has sentimental value worth way more than what I paid for it. An average pack with decent fit yet a high value for $100! No issues maintenance-wise. Zippers are all functional and material is in-tact. It's simplicity makes for fewer things to break in the first place.